The Qx 12G HDR/WCG toolset provides new instruments to speed 4K/UHD and HD-SDI workflows with enhanced visualization and analysis. Phabrix will show the latest upgrades and options for its top-of-line Qx 12G at SMPTE LA 2018 and NAB NY. The Qx 12G a fully flexible 4K/UHD rasterizer for 12G/6G/3G/HD signal analysis, generation and monitoring. The new configuration is designed for next generation, hybrid IP/SDI environments using 12G/6G/3G-SDI 4K/UHD and HD-SDI, plus SMPTE 2022-6 and SMPTE 2110, with NMOS in an upcoming software release. The Qx 12G provides the fastest 12G-SDI physical layer testing with Real-Time Eye technology. Additional 12G/6G/3G/HD-SDI physical layer tools include Jitter analysis with monitoring across five specified frequency bands, as well as UHD/HD pathological test patterns. Built-in automation control allows testing to be performed faster, more reliably and at lower cost. A comprehensive HDR/WCG toolset offers new instruments to enhance the visualization and analysis of 4K/UHD and HD-SDI content to speed workflows. The HDR/WCG tools include a signal generator, CIE chart, luminance heat-map, vectorscope and waveform, all supporting BT. 2100 HLG, PQ and Sony S-Log3 and SR Live. The Qx 12G provides a user-defined, fully configurable, multi-instrument user interface, allowing users to adapt the display for their preferences. It can be controlled remotely, offering analysis, monitoring and automated testing from any location. The remote interface uses VNC technology providing up to 16 simultaneous instrument windows with network access to event logs, screenshots and user presets. The unit offers 4K/UHD simultaneous generation and analysis with 12-bit YRGB/YUV, and a waveform monitor with H&V zoom and vectorscope for checking color bias/conformity. 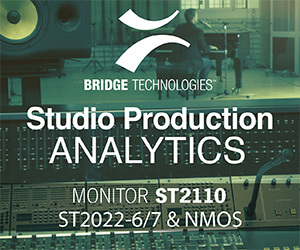 Optional IP generation and analysis include SMPTE ST 2110 and ST 2022-6 decapsulation/ encapsulation, packet interval timing (PIT) analysis histogram for monitoring network traffic. It includes a packet profile generator for stress testing video networks, along with stream & network analysis tools. It also supports IGMP v2/v3 network multicast management. Optional HDR/WCG generation and analysis includes support for BT. 2100 HLG PQ and Sony S-Log3 and SR Live and a CIE chart (Rec. 709, Rec. 2020, ST 2086). It also includes a HDR test pattern generator, waveform with code value and Nits, a vectorscope with graticules/targets for HDR, SDR and WCG, and waveform ITU-R 2408 diffuse white markers. An HDR heat-map highlights signals beyond SDR.